Who Started the Apple Cider Vinegar Craze? Perhaps Scarlett Johanssen deserves quite a bit of credit for the recent rise in popularity of apple cider vinegar (ACV) as a skin treatment. You might expect that the stunning movie actress would be using one the most expensive, better known skin products so I’m certain that many people were rather surprised that she credits ACV for her beautiful, glowing skin. Since then many people started using apple cider vinegar for acne. This humble product is organic, natural and inexpensive and has long been used for a variety of other health benefits. It is not only teenagers that suffer from acne and other skin issues. My wife has been plagued with dry skin all of her life and in the interests of independent research, she has recently started to use apple cider vinegar as a toner. It is too early to confirm how well it works, but after a week of use, she is largely positive about it. I don’t want to appear stingy, but I hope she remains so positive because it’s a lot cheaper than most of her skin products which incidentally seem not to have much effect. Apple cider vinegar is a fermented juice made from whole crushed apples, including the skin and the core. Unlike the everyday refined types of vinegar, real unrefined apple cider vinegar is both organic and unpasteurized. The very best ACVs contain the ‘mother’ of vinegar, the rather nasty looking substance which settles at the bottom of the jar or the bottle. Despite its appearance, it’s the ‘mother’ which contains all the great substances which prove to be so beneficial for your health. Historically vinegar has been used for many thousands of years since it was allegedly discovered when grape juice which was left unattended for too long turned into vinegar. Hippocrates is said to have used vinegar to treat wounds and it was picked up by medical practitioners later to treat just about everything from stomach aches to poison ivy. These traditional uses are finding a new audience in the modern age and much has been written about the special health benefits conferred by apple cider vinegar in particular. Apple Cider Vinegar is a completely organic and natural product containing none of the chemicals or filler ingredients found in conventional over the counter acne treatments. As well as its positive skin care uses, taken internally apple cider vinegar is said to have a number of health benefits including weight loss, reducing blood sugar levels and aiding digestion. ACV is also a great way to detox as it helps rid the body of bacteria, fungus and candida. Why is Apple Cider Vinegar good for your skin? During the fermentation process used to create ACV, acids such as malic and alpha hydroxy acid are formed. These are the main substances which help your skin to fight outbreaks of acne. The reason this works is that the surface of your skin contains an acid mantle (a thin layer of oil) which helps protect it against the environment and a variety of germs. Many skin products can have a detrimental effect on the skin’s acidity which in turn weakens its ability to protect itself. Unlike the acids contained in most of the skin products on the market, the acids found in apple cider vinegar reinvigorate the skin by balancing its natural acid levels in a naturally effective way. It helps balance out the pH levels in the skin. It can exfoliate older skin cells. It stimulates the growth of fresh skin cells. It helps cleanse and shrink the pores. It helps to remove excess grim and oil from the skin. It can reduce wrinkles and other signs of aging. It can reduce the appearance of scars caused by acne and other skin conditions. It has astringent properties which helps tighten the skin. It is important that your skin is properly pH balanced. If not, your skin might very well break out in acne, or become too dry or overly oily. In short, without a properly balanced pH level your skin will not be clear. A toner made from diluted apple cider vinegar will help to balance your skin’s pH levels. It will unblock your pores and protect against bacteria. The health and appearance of our skin often mirrors our general internal health. Of course there are hormonal issues at play but by and large you can achieve healthy looking skin through good hydration, diet and proper skin care. Unfortunately millions of people are plagued by chronic acne breakouts which range in severity and while not dangerous, left untreated, it can lead to long term scarring and low self-esteem. Acne is mainly caused by a clogging of the pores, excessive production of oil and bacteria. However other factors such as diet, hormonal changes, stress and other medications are also major factors. Recent research is even showing that sleep deprivation can cause acne and that it is not only teenagers that are affected. Many women break out in acne around the time of their periods or when reaching their menopause. Fortunately, there are numerous natural remedies that you can try and one of the most effective according to numerous testimonials is apple cider vinegar. Making an apple cider vinegar toner yourself at home is easy and using it instead of harsh over the counter products may prove invaluable. The effects and properties of apple cider vinegar mentioned in the previous section make it the ideal natural choice for your home acne treatment and skin care regime in general. Apple cider vinegar skin toner is very easy to make at home. It is strong stuff so you will need to dilute it with water when making your toner. At first, it is best to dilute your apple cider vinegar to a 1:2 ratio before applying it to your skin. You can experiment with the ACV to water ratio later to see what your skin responds to best. Apply your toner to your skin with a cotton ball or a pad. Be careful to avoid the eyes. If you want to get creative, you can infuse the water with aromatic fresh herbs. Simply chop your preferred herb and add it to boiling water. Let it simmer for 30 minutes, strain the water and then let it cool. This herb infused water can be used to replace the regular water in your toner mixture. This is an excellent face mask recipe that will help take care of your skin as well as getting rid of acne and scarring. Try following these simple steps at least once a week for best results. Combine 2 tablespoons of apple cider vinegar with around 3 tablespoons of baking soda. Mix it well and apply the finished mixture to your entire face as a mask. Leave the mask on for around 20 minutes- it should start to feel tight and dry. Rinse the mixture off your face with water then pat it dry and apply your moisturizer of choice. Honey has antibacterial qualities that are excellent for your skin especially when combined with apple cider vinegar. Try following this routine once or twice a week. Wash your face with warm water only. Exfoliate the skin with baking soda. Treat your face to a steam treatment by bending over a sink full of hot water and covering your head and shoulders with a towel. Steam for around 3 minutes. Now apply 2 tablespoons of good quality raw honey to your face paying special attention to any acne. Leave the honey in place for around 20 minutes then rinse it off with warm water. Finally, apply a mixture of apple cider vinegar and water in equal parts with a cotton ball. After 10 minutes or so, rinse the mixture off. 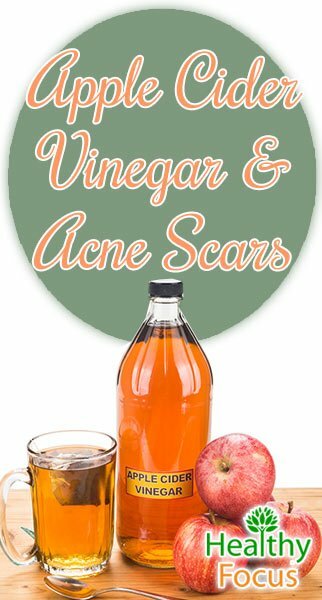 If your skin has become scarred or pitted because of acne, it is possible to use apple cider vinegar to diminish the appearance of these scars. Do not expect instant results, it will take quite some time for these methods to work fully. Mix your apple cider vinegar with water in an equal ratio or use more water if you are new to applying ACV to the skin. Apply the mixture to your acne scars and allow it to work on your skin for at least 10 minutes. Baking soda has a mild exfoliating effect and when combined with apple cider vinegar helps remove dead cells and also stimulates the production of collagen to fill in the area of the scar. Mix a little water and baking soda into a nice smooth paste and use this on your first day of treatment. On the next day dilute your apple cider vinegar with clean water and apply the mixture to your face with a cotton ball. Wash it off after about ten minutes. Repeat the 2 day cycle for as long as necessary. Tea tree essential oil is one of the best home remedies for acne and for reducing the appearance of scars. When used in combination with apple cider vinegar, this antibacterial oil can be even more effective. Be careful if you have sensitive skin as tea tree oil is very strong and can cause sensitivity. Even after diluting it, you should perform a patch test to test against reactions. Add 2 or 3 drops of tea tree essential oil and mix well. Apply the mixture to your acne scars with a cotton ball or pad. Rinse it off after 10 minutes or so. Repeat daily until your scaring has diminished. As well as getting the benefit from applying apple cider vinegar to your skin, it is a very effective treatment when taken internally. It can both help your skin and help benefit your health in countless other ways. Many people even take a few spoons full of apple cider vinegar to help them control their weight. Drinking apple cider vinegar can help improve your digestion as well as helping you to clear away any toxins that have accumulated in the body. It is important that you rinse out your mouth after drinking apple cider vinegar to protect against damage to your tooth enamel. • Add 2 tablespoons of ACV in a glass of water. • Add one teaspoon of good quality raw honey to taste. • Mix well and drink once every day. Some people are put off by the smell of apple cider vinegar and there is no doubt that it has quite a pungent aroma. If you can get over the initial smelly shock, the aroma tends to wear off after being applied and drying on your skin. I can confirm from personal experience that my wife does not smell too badly and she is not bothered by the smell at all. 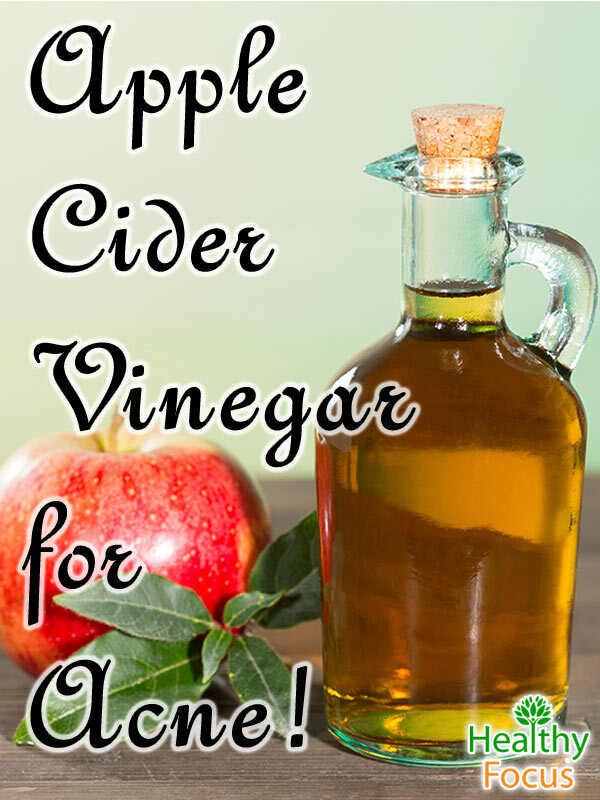 If you are bothered by the smell, simply wash off the ACV after drying to eliminate any odor. Do not forget to take care of your entire body. Many people suffer from pimples and acne on their backs and apple cider vinegar can be used equally as effectively on your body as on your face. It goes without saying that your skin is extremely sensitive use caution to start. If you are using apple cider vinegar for the very first time, it is advisable to rinse it off with warm water after 5 minutes or so. If you find that you don’t react to it badly then don’t bother rinsing it off…this will help in building up your skin’s tolerance. Which apple cider vinegar should I buy? As I mentioned earlier in the piece, it is important to use the real unrefined apple cider vinegar, preferably one that contains the ‘mother’ of vinegar. Make sure that you don’t confuse this with refined vinegar used for cooking. There are a number of apple cider vinegar brands which tick the boxes. Bragg apple cider vinegar is probably the best known brand. It is certainly one of the most established and trusted brands on the market. Bragg uses only organic, pesticide free apples sourced from inside the United States. Vitacost’s apple cider vinegar range is one of Vitacost’s many health products made from 100% organic apples. It also ticks the boxes being unpasteurized and containing the ‘mother’ of vinegar. Other brands to consider are Dynamic Health apple cider vinegar and Fleischmann’s apple cider vinegar. Both of these brands claim to use 100% organic apples and their apple cider vinegar is unfiltered and unpasteurized. I will conclude by noting that when researching this article I came across a number of testimonials on a variety of websites including acne and skin care forums. The general consensus regarding the effectiveness of apple cider vinegar seems to be positive. There are one or two specialist sites that are not so convinced. This article for example is reluctant to fully endorse apple cider vinegar as a sole treatment for acne but goes on to suggest that it could well be effective as part of an overall acne treatment plan.